Dr. Chandrasena assumed duties in Vice Chancellor’s office today (September 22, 2014) as the third Vice Chancellor being the successor of previous Vice Chancellor in the history of Uva Wellassa University. The new Vice Chancellor initially joined Uva Wellassa University at its inception in 2006 and ever since he had been holding several positions; such as Head, Department of Export Agriculture, and Dean, Faculty of Animal Science and Export Agriculture at Uva Wellassa University. Dr. Chandrasena is considered to be the most senior academic staff member of Uva Wellassa University. The new Vice Chancellor is an eminent Microbiologist before joining Uva Wellassa University. He was working as a Principle Research Officer in the field of Microbiology at the Sugar Research Institute of Sri Lanka. Further, he was the Head of the Crop Protection Division at the time he left Sugar Research Institute. 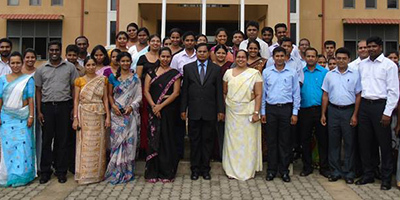 Dr. Chandrasena was a passed out graduate from the University of Peradeniya with a BSc in Agriculture. He later obtained his MSc degree from the University of Kelaniya and also had earned an MPhil degree from the University of Peradeniya in the same field. Dr. Chandrasena possesses his Doctor of Philosophy Degree from the University of Abertay, Dundee, UK.